When we were packing up to leave Christchurch, car full to bursting, every bit of consolidation seemed a small victory. I took our bulging bag of jalapeños and reduced half of them into jalapeño jelly. It was my first attempt at making jelly, and it turned out great, so I decided to share the recipe here. 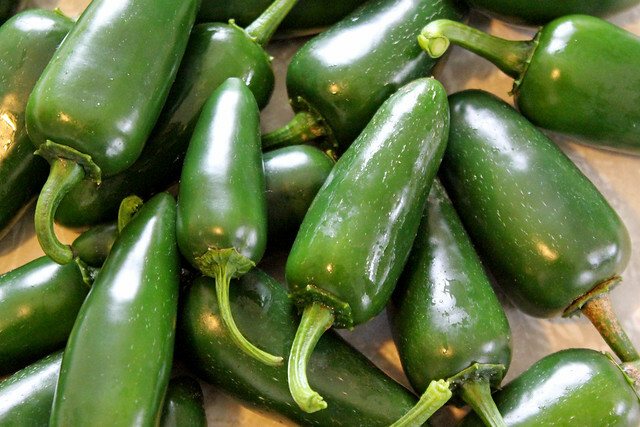 Jalapeños are almost unheard of in New Zealand. If you're unfamiliar with them, they are a small to medium-sized spicy capsicum pepper that originated in Mexico. They're very popular in Texan cuisine, but I never knew I would miss them so much when I came here. 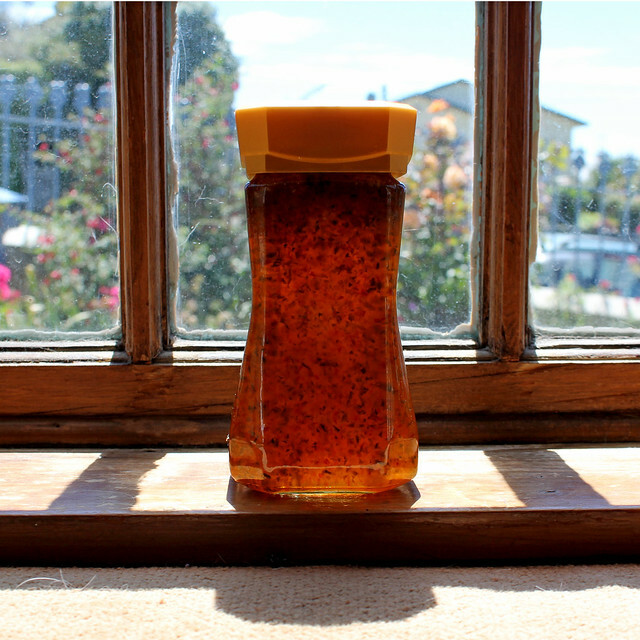 Thanks to Chris Miller for giving me the idea to make pepper jelly, and also for the tips. His mother runs Tavish's Kitchen in Cromwell and makes all sorts of delicious preserves. Sterilize jars in dishwasher or by boiling, then allow to dry thoroughly. After removing stems and seeds from jalapeños, chop in food processor with vinegar until somewhere between a mince and a puree. The chunks will give the jelly a nice confetti look, especially when using both red and green jalapeños. If you're making a full batch, use only 1 cup vinegar so you don't overfill the food processor, then add the rest after. Place jars in oven and heat to 100ºC. Add puree to a large saucepan with jam setting mix. Bring to a boil, then add sugar. Bring to a boil again and boil for 8 minutes, stirring constantly. Remove from heat. Skim foam, if necessary, and let sit for 10 minutes. Ladle or pour into jars. 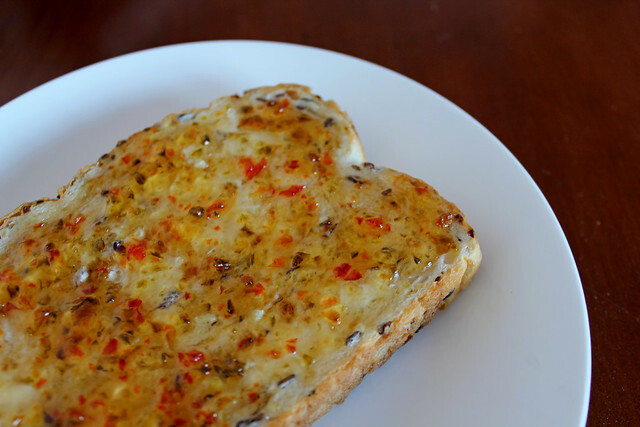 Jalapeño jelly gives a nice sweet heat to toast, on its own or with cream cheese. It's also a nice addition to blue cod, as we discovered with our couchsurfing hosts in Oamaru. I was surprised how easy it was to make, and I look forward to making more when we're back in Texas. I'm definitely going to make some of this! VERY inspired! Just you wait! Were your peppers red when you made it? I used both red and green peppers, with slightly more green ones than red. The red color dominates, but I like my jelly all natural, so I wouldn't use green food coloring. We have had your 'thank you' postcard sitting by our computer for months and now finally saying "thanks for sending it" ! It has been great to see your blog and follow your travels. You have certainly been far and wide. You are very welcome to call in and say hello when (or if) you end up back in Auckland. It would be lovely to see you. It's so neat to hear from you! Hope all is well with you two, and if we stop through Auckland, we'll get in touch. Take care!